In Holly's earlier post she had some great photos of the blizzard. Here is a photo of a mostly cleaned up black oak that had toppled over in the same storm. The damage from that storm was caused by two factors. The initial factor was a wet and heavy snowfall. Secondly, the winds that followed put a substantial stress on the already burdened trees. I wanted to share this photo for a few reasons. 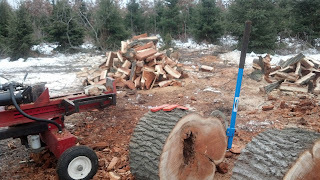 It shows my freshly wielded wood splitter in the field. An action shot! Also in the picture are a few tools that I find invaluable for cutting up and handling of big trees. In addition the firewood round shows additional clues as to why this particular tree failed. I have found a strong affinity towards wedges. Yes, an iceberg wedge salad with bacon dressing is a tasty thing. But the wedges I write of are those three little orange things on the piece of firewood in the photo. Let me describe their use for those of you who may not be familiar. 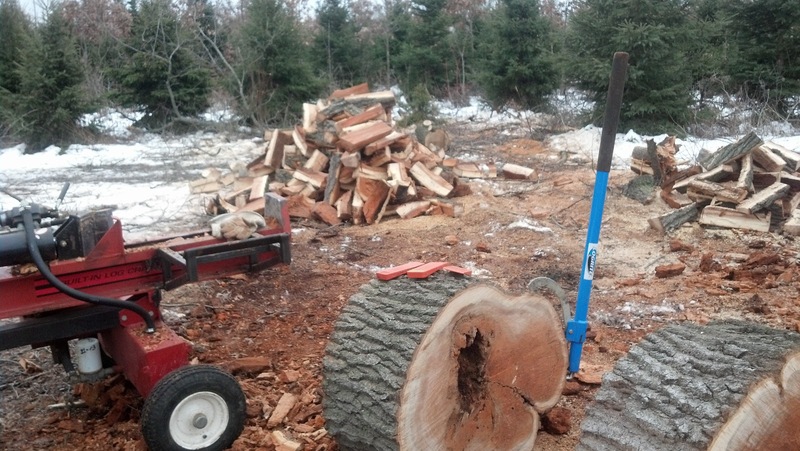 With either a long log or one that is large in diameter, chainsaws may have their bar pinched while cutting across the log. I used to remedy this by placing little twigs in the kerf, which is the gap in the wood created by the saw. Without fail the twigs would crush and not hold the kerf open or I might not be able to find a twig the proper size. Now I simply hammer these plastic wedges into the kerf to keep it open and cut away. The wedges in the photo are made by Stihl. The plastic construction helps chain life in the case of accidental contact. I knew I should use wedges, I just never bothered with them. I was foolish. The second tool that is shown in the photo is a cant hook. It is the long blue handle hooked onto the round piece of firewood. To quote Archimedes "Give me a lever long enough and a fulcrum on which to place it, and I shall move the world." The black oak was about 34 inches across and moving that large of wood without a cant hook isn't much fun. They come in a number of sizes, this one is 48 inches. Why did this tree fail? Besides the aforementioned factors this tree wasn't healthy. The log is partially hollow. The heartwood is suffering from brown rot, which negatively effects a trees bending strength. In other words it makes the tree brittle. In addition this was a tree Joe and I referred to as "the leaner." That is an example of leverage having a negative consequence. In the background of the photo you may notice White Spruce, well fortunately only one was damaged by this incident. Forester vs Arborist - What's the Difference? Introducing the... "Name that Pond" Contest!